Providing you the best range of docetaxel and disulfiram with effective & timely delivery. 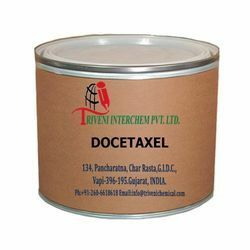 Docetaxel (148408-66-6) is white powder. it is use in Oncology, metastatic prostate cancer, cancer Industry. Storage: Keep container tightly closed. Keep container in a cool, well-ventilated area. Waste Disposal: Waste must be disposed of in accordance with federal, state and local environmental control regulations. Disulfiram (97-77-8) is beige powder. It is also known as tetraethylthiuram disulfide, Bis-diethylthiocarbamyl disulfide and Bis-diethylthiocarbamoyl Disulfide. it is use in chronic alcoholism Industry.Disulfiram (97-77-8) is beige powder. It is also known as tetraethylthiuram disulfide, Bis-diethylthiocarbamyl disulfide and Bis-diethylthiocarbamoyl Disulfide. it is use in chronic alcoholism Industry. Looking for Chronic Alcoholism API ?